A book detailing a culture of corruption in Kenya is making booksellers and government officials uneasy, but for different reasons. The fear of reprisals is keeping sellers from stocking it, while top officials named in the book are threatening to sue for libel. The book, “It’s Our Turn to Eat: The Story of a Kenyan Whistleblower,” by Michela Wrong, focuses on John Githongo, whom the Kenyan government hired in 2003 to head an anti-graft unit. 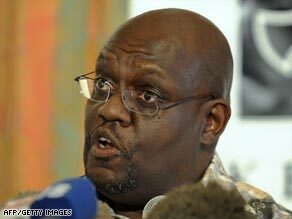 Githongo’s investigations detailed an intricate web of corruption, allegedly featuring top Kenyan politicians. The most noted scandal — Anglo Leasing — revealed fraudulent deals, in which a fictitious company was paid millions of dollars for contracts using government funds, Kenyan media reported. Githongo, a former journalist, resigned in 2005 and fled to England. Wrong, an old friend, initially offered him shelter there. The Kenyan government started a manhunt for him in the UK, Wrong said. A year later, Githongo released an explosive report detailing government fraud, which led to the resignation of some Kenyan politicians linked to the scandal. Attempts to reach Githongo through a spokesman were unsuccessful. The fact that there is corruption in the east African nation is not surprising. Bribery is so intertwined with the Kenyan culture, there is a code word for it. When someone offers a sly smile after a service and asks for “chai,” Swahili for tea, that’s a cue to slap a bill on his outstretched palm.